Early computer buses were parallel electrical wires with multiple connections, but the term is now used for any physical arrangement that provides the same logical function as a parallel electrical bus. Modern computer buses can use both parallel and bit serial connections, and can be wired in either a multidrop (electrical parallel) or daisy chain topology, or connected by switched hubs, as in the case of USB. Computer systems generally consist of three main parts: the central processing unit (CPU) that processes data, memory that holds the programs and data to be processed, and I/O (input/output) devices as peripherals that communicate with the outside world. An early computer might use a hand-wired CPU of vacuum tubes, a magnetic drum for main memory, and a punch tape and printer for reading and writing data. In a modern system we might find a multi-core CPU, DDR4 SDRAM for memory, a solid-state drive for secondary storage, a graphics card and LCD as a display system, a mouse and keyboard for interaction, and a Wi-Fi connection for networking. In both examples, computer buses of one form or another move data between all of these devices. Given these changes, the classical terms "system", "expansion" and "peripheral" no longer have the same connotations. Other common categorization systems are based on the buses primary role, connecting devices internally or externally, PCI vs. SCSI for instance. However, many common modern bus systems can be used for both; SATA and the associated eSATA are one example of a system that would formerly be described as internal, while certain automotive applications use the primarily external IEEE 1394 in a fashion more similar to a system bus. Other examples, like InfiniBand and I²C were designed from the start to be used both internally and externally. However, this distinction—​​that power is provided by the bus—​​is not the case in many avionic systems, where data connections such as ARINC 429, ARINC 629, MIL-STD-1553B (STANAG 3838), and EFABus (STANAG 3910) are commonly referred to as “data buses” or, sometimes, "databuses". Such avionic data buses are usually characterized by having several equipments or Line Replaceable Items/Units (LRI/LRUs) connected to a common, shared media. They may, as with ARINC 429, be simplex, i.e. have a single source LRI/LRU or, as with ARINC 629, MIL-STD-1553B, and STANAG 3910, be duplex, allow all the connected LRI/LRUs to act, at different times (half duplex), as transmitters and receivers of data. 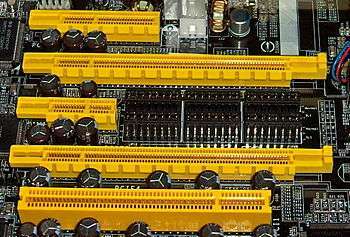 Early microcomputer bus systems were essentially a passive backplane connected directly or through buffer amplifiers to the pins of the CPU. 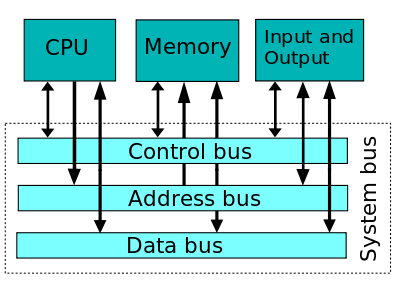 Memory and other devices would be added to the bus using the same address and data pins as the CPU itself used, connected in parallel. Communication was controlled by the CPU, which had read and written data from the devices as if they are blocks of memory, using the same instructions, all timed by a central clock controlling the speed of the CPU. Still, devices interrupted the CPU by signaling on separate CPU pins. For instance, a disk drive controller would signal the CPU that new data was ready to be read, at which point the CPU would move the data by reading the "memory location" that corresponded to the disk drive. Almost all early microcomputers were built in this fashion, starting with the S-100 bus in the Altair 8800 computer system. ↑ "bus Definition from PC Magazine Encyclopedia". pcmag.com. 2014-05-29. Retrieved 2014-06-21. ↑ Linda Null; Julia Lobur (2006). The essentials of computer organization and architecture (2nd ed.). Jones & Bartlett Learning. pp. 33,179–181. ISBN 978-0-7637-3769-6. ↑ C. Gordon Bell; R. Cady; H. McFarland; B. Delagi; J. O'Laughlin; R. Noonan; W. Wulf (1970). "A New Architecture for Mini-Computers—The DEC PDP-11" (PDF). Spring Joint Computer Conference: 657–675. ↑ Bray, Andrew C.; Dickens, Adrian C.; Holmes, Mark A. (1983). "28. The One Megahertz bus". The Advanced User Guide for the BBC Microcomputer (zipped PDF). Cambridge, UK: Cambridge Microcomputer Centre. pp. 442–443. ISBN 0-946827-00-1. Retrieved 2008-03-28.